With heavy winter snowfalls and frigid temperatures, it is common for snow and ice to accumulate on roofs in Ottawa. When snow and ice accumulate on top of your roof, they can quickly become a hazard, especially along flat surfaces and seams, such as the chimney. Here are a few of the dangers snow and ice can potentially cause and why they’re so important to avoid. As light and fluffy as snow may appear when it falls, we know how deceiving it can be and anyone who has experienced shovelling knows this deception all too well. Once that snow begins to melt and combine with water, it can become extremely heavy. In fact, 10-12 inches of fresh snow equates to 1 inch of water, which weighs about 5 pounds. You can imagine just how heavy and dangerous all of that snow that’s been accumulating on your roof can really be. It can take little time for lingering snow to soften the surface of the roof and eventually weaken the structural integrity of it. Although this can usually take a more significant amount of time to cause severe damage, a heavy snowfall can be all that’s needed to place pressure on areas that may already be frail and decaying. Accumulating ice and snow can cause a form something called an ice dam. 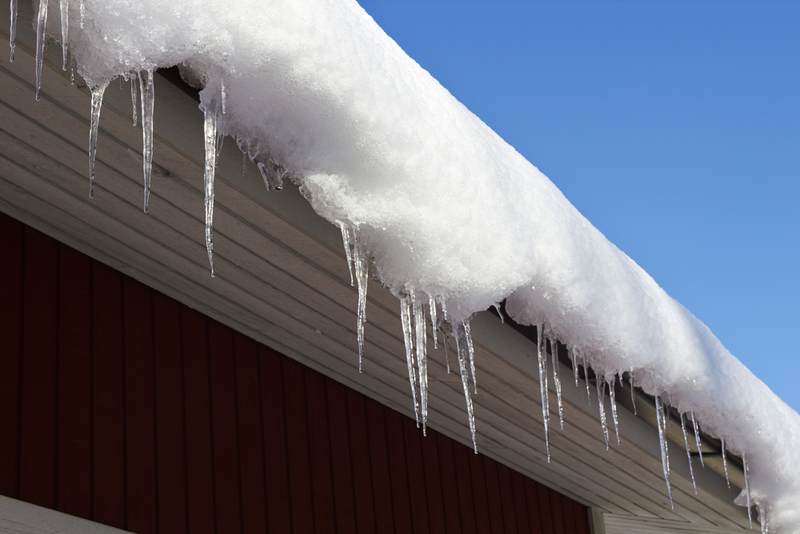 In the cold weather, ice can collect along the edge of your roof and prevent melting snow from draining off as it should. This water gets backed up, and wants to find somewhere to go. As a result, it can leak into your home and damage the walls, ceiling, or insulation. Roofs that are flat or built without the proper support structure for minimizing weight and pooling moisture, are the most susceptible for collapsing under excessive weight. This is why it is imperative to consider your location and climate whenever you are designing or considering purchasing a home with a flat roof. Annual maintenance and inspections are essential for helping to prevent any severe consequences from all of that accumulating snow. You can contact us and have an expert assess and inspect your roof and of course, perform any repairs that might be necessary to keep it good and strong against those harsh and potentially heavy winter elements. We also offer rooftop snow removal services in the winter to reduce weight on the roof and prevent the formation of roof dams.